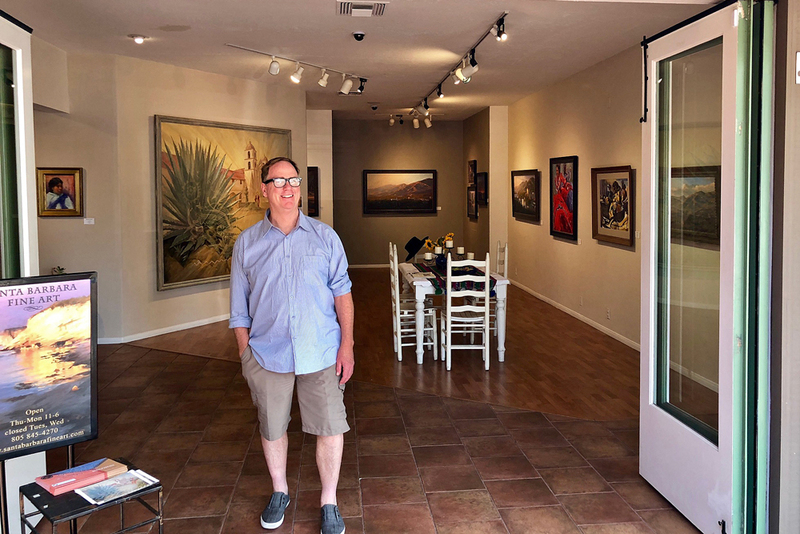 A new art gallery in Santa Barbara’s Arlington Plaza is owned and curated by landscape painter Richard Schloss, pictured, and his wife Julie. Santa Barbara Fine Art has opened inside Arlington Plaza, and the gallery showcases works from emerging local artists. The gallery, at the 1324 State St. plaza, is owned and curated by Santa Barbara landscape painter Richard Schloss and his wife Julie. “My paintings, in their subject matter and composition, are very serene and tranquil which appeals to people in this age of quick and assaulting images,” Schloss said. On display at the museum are works from Arturo Tello, Larry Iwerks, John Wullbrandt, Carrie Givens, Rob Robinson and Michael Enriquez. Other artists include pastelist Marsha MacDonald and abstract painter Heather Gordon. Schloss's paintings can also be found in permanent collections of four museums, including the Santa Barbara Historical Museum, Santa Barbara Museum of Natural History, Ridley Tree/Westmont Museum and The Museum of Ventura County. Schloss is one of the founders of the Oak Group, formed in 1986, whose mission was to bring public awareness to preservation efforts in areas throughout California.